US, 1938, 87 minutes, Black and white. Edward G.Robinson, Claire Trevor, Humphrey Bogart, Allen Jenkins, Donald Crisp, Gale Page, Henry O'Neill, John Litel, Thurston Hall. 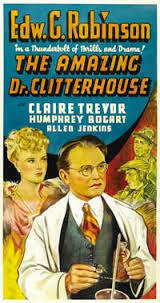 The Amazing Doctor Clitterhouse sounds like one of those many biographies from Warner Brothers in the latter part of the 1930s. In fact, the star of this film, Edward G.Robinson starred in Dr Erlich’s Magic Bullet as well as Dispatch from Reuters. In fact, the doctor is a celebrated surgeon as well as a welcome visitor to social events. He is the friend of the police and treats them for their ailments. But, as we initially learn, he is also involved in robbing jewellery, not for the sake of the jewellery, but for the sake of his research. He claims he wants to understand the criminal mind and the only way is for he himself to become a criminal. He is successful, learns of the name of a fence from the police themselves, and discovers that she is a woman, played by Claire Trevor. He decides to conduct an experiment, organising robberies, gathering together a squad. The unwilling member, and becoming jealous because of Claire Trevor’s attachment to the man they call The Professor, is Humphrey Bogart, on his way up in Hollywood. When the doctor is finally apprehended, he has explained his situation to a lawyer and has found that he could be judged insane – which would still give them the opportunity to complete his work. Something different for Edward G Robinson, quite entertaining for audiences. 1. Film of the 1930s? Warner Brothers? In the tradition of biographies? Warners visual style? The cast? 2. The title and expectations? 3. Black-and-white photography, American cities, the world of the rich, criminals, the police? The musical score? 4. The basic premise? Dr Clitterhouse as respectable, professional, his presence, at socials, known to the police, treating them for their ailments? His work with Nurse Randolph? The scene of the robbery, Okay and his attempt, being held up, Rocky watching and disappearing? The doctor’s expertise in taking the phone calls, not under suspicion, leaving the party? The operation, the preparations, Grant and his irritability? Nurse Randolph seeing the bag and the jewels? Her loyalty? Taking the bag to the police office? Okay identifying Dr Clitterhouse? 5. The doctor’s theory, for research, testing himself by becoming a criminal, observing himself? For successful jewell robberies? The police and the information about fencing the jewellery? His going to see Jo, the plan? 6. Jo, as a fence, her cover as a woman? The style? The gang? Butch as her personal guard? The attraction to the Professor? 7. The plan, the different robberies, the different personalities in the group, working together, loyal to the professor? His checking them physically, the blood tests, compiling his research file? 8. Rocks, critical, interested in Joe, working with the Professor, but critical of him? The furs robbery, Rocks locking the Professor in the vault? Butch to the rescue? 9. The reunion, the last robbery, paying everyone and some extra, their all leaving, professing loyalty? Rocks getting his money? His implement in the phone to get the number when the Professor dialled? Talking with Jo about it? 10. The Professor, allegedly on a trip to Europe, phoning in the diagnoses and commands? His return, the explanations and Nurse Randolph? Rocks arriving, envious of the Professor’s situation, taunting him with the manuscript, wanting to keep it as a hold over him? Jo and her arrival? 11. Inspector Lane, his hard work, being bawled out by authorities, his bawling out the others? The Detective? Visiting Jo’s house, the group gambling, the professor challenging the policeman, for his search warrant, demanding an apology – and the policeman taking the pretzels covering the jewells but the professor preventing his searching the premises? 12. Dr Clitterhouse, the visit from Grant, the law, his explanation of the whole situation, Grant concluding that the protagonist was insane? The arrest? The case in court, Grant representing the doctor? The expert and his but confusing the judge? The issues of sanity and insanity? The jewellery and the head of the jury and his frustration, his speech about proving sanity meaning insanity? 13. The touch of the tongue in cheek, especially the Professor’s confidence in dealing with the gang, his civility and manners? Attraction to Jo? His willingness to go to jail or to the mental hospital as long as he had the possibility of publishing his findings and contributing to the police in their work and the psychology of criminals?